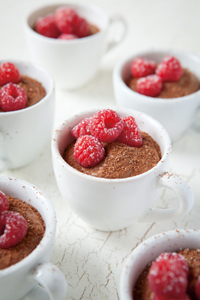 1 To make the mousse, break 95g of the plain chocolate into pieces and place these in a large heatproof bowl. Set the bowl over a pan of gently simmering water until almost melted. 2 Remove the bowl carefully from the pan and stir the chocolate with a wooden spoon until it’s smooth. Leave to cool for about 15 minutes but don’t let the chocolate set. 3 Stir the custard into the melted chocolate until smooth. Whisk the egg whites in a large bowl with an electric whisk until fairly stiff but not dry. 4 Stir a third of the egg whites into the melted chocolate mixture with a large metal spoon to loosen, then fold in the rest. 5 Divide the mixture between 6 dessert dishes or coffee cups. Cover them with cling film and chill for at least 1 hour. 6 When you’re ready to eat, take the dishes out of the fridge and uncover them. Tumble a few raspberries into the centre of each one, dust with sifted icing sugar and grate the remaining chocolate over the top. Serve this on the day of making.